Started in 1965, the NAGT-USGS Cooperative Summer Field Training Program is the longest continuously running internship program in the earth sciences. Over the past fifty years, more than 2300 students have participated in this program with an impressive number of these individuals becoming full-time employees of the USGS. This cooperative program was launched at the Geological Society of America meeting in Kansas City in early fall of 1965 when William "Bill" Pecora, then the newly appointed Director of the USGS, held a meeting with a small group of distinguished professors and officers of the NAGT. Pecora felt strongly that the USGS needed to be more engaged in geological education. He had a plan for how this might be accomplished and wanted to get the professors' reactions to an initiative that would provide better linkage to academia while, in the process, providing better summer field assistants for the USGS. Pecora suggested that the USGS would provide support by way of internships for outstanding undergraduate geoscience majors, while NAGT would advertise the program to faculty and students, solicit nominations, distribute applications, and assist in processing all materials. Needless to say, "Pecora's Plan," as it became known, met with instant approval. USGS will decide among the applicants and then hire the selected NAGT nominees for available field, laboratory, or office related scientific positions throughout the country for up to 5 months. USGS places interns wherever the project scientists need them. Most recently, interns have worked in Reston, VA; Menlo Park, CA; Miami, FL; St. Petersburg, FL; Denver, CO; Woods Hole, MA; Baltimore, MD; Seattle, WA; Dover, DE; Trenton, NJ; Vancouver, WA; Indianapolis, IN; Lincoln, NE; Columbia, SC; Santa Cruz, CA; and many other locations. Field camp directors and students can get more information about the program at the USGS Program Page. 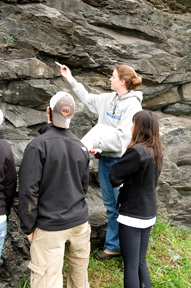 Please refer to the USGS Field Camp Survey for a comprehensive list of national college and university geoscience field camps. Deadline for Nominations is October 8, 2018, midnight PST. Nominated students apply by sending their resume to the USGS Education Office along with a letter of interest and transcripts. At the same time, USGS scientists interested in working with an intern send information about field, laboratory, or office-related scientific projects to the Education Office. Candidates are then matched by skill and interest with up to five projects. The listing of candidates and accompanying academic information are sent to USGS scientists for review, interviews, selection, or possible further discussion. USGS personnel make final selections. As interdisciplinary, system science is a cornerstone of our science, all disciplines are encouraged, and do take advantage of, this program's support and available talent. Students hired through this program have continually received outstanding reviews from our managers; and, over the decades, many of these individuals have become full-time colleagues. Interns employed through this program are hired at a rate commensurate to their educational level and experience, typically at a GS-5 Grade, Step 1, with an adjusted locality payment. Over the years, NAGT has succeeded in identifying top-flight students for the program, and the USGS has succeeded in garnering the interest of competent and enthusiastic supervising mentors. Evaluations of the program by the students have been strongly positive, and the interns have continually received outstanding reviews from USGS managers. The NAGT-USGS Cooperative Summer Field Training Program continues Pecora's vision of greater educational involvement, and provides a first-rate professional experience to students early in their careers. Current-year interns should complete the program evaluation questionnaire to help us continue to evaluate the program's effectiveness and impact. If you took part in an internship in the past, please consider reflecting on your experience and how it affected the path of your personal and/or professional life. NAGT is gathering these stories via the reflections form and will use these stories to both evaluate the program and to generate new materials for the program website. You can see the collection of reflections that have already been submitted by past interns on the Reflections page. Daniel Butler, Ft. Lewis C.
Julie Francis, LA State U.
Alan Lloyd, ID State U.
Brian McGeehan, Penn State U.
Lori Robinson, UT State U.
Michael Dailey, N. Illinois U.
Jill Feltovich, S. Illinois U.
Erin Holmstad, U. of Wash.
Jeffrey Mann, N. Illinois U.
Jeffrey Mlekush, U. New Mex. Deana Sanders, NE. Louisiana U.
Joe Bristor, Sol Ross St.
Ingrid Klich, New Mexico Inst.